The last few days have been torture. Not because it was too cold (not that -31 F with wind chill factored in is fun, but you can always dress for cold), but because the unceasing, extremely high winds meant that there were lots of flying debris outside, making it unsafe to walk through the woods. My very strong, fortress-built home actually shook and rattled for three days nonstop; the wind howled and often woke me up at night. Lots of trees down (nothing major on our property, thankfully). Fortunately we were unaffected by any power outages since our house is run on batteries and we do have a back-up generator if necessary. While “housebound,” I used the time to cook, bake and clean. I did a little strength training with dumbbells but really my body just did not get the necessary amount of exercise and boy, did I feel blah. My old bones and muscles were stiff; I needed to move. Fortunately today the sun came out, the wind died down, and I was able to go for a 4-mile walk (it was a pleasant, sunny 20 degrees F). Unusual for me, since I prefer listening to the sounds of nature, I walked with headphones plugged into Adele. And suddenly, I don’t know, the music just took over. I started jogging, then skipping, which segued into dancing. There I was, this grey-haired grandmother, bundled up in Polartec and looking like a penguin, and I’m jumping, twirling, turning, high-stepping, and rocking out on my country road, just me and Adele. And here is what is great: I felt totally free. No one was around. The trees didn’t think I was weird. Oh, my kids would have thought me ready for the asylum had they seen me. But it felt great. Friday was just about a perfect day. The sky was a deep blue, with puffy white clouds, and the air was clear and dry, in the mid-70s. The breeze was light enough to keep away the bugs (although the blackflies are gone, huge swarms of mean-spirited deerflies have replaced them and can make a walk outdoors an exercise in masochism) but not so windy that there would be chop in the water at the lake. In other words, a perfect day to go fishing. Kayaking and fishing on Virginia Lake. I was the only one there. It was my first visit of the year to Virginia Lake, an off-the-beaten-track sort of place that even most Mainers don’t know about. 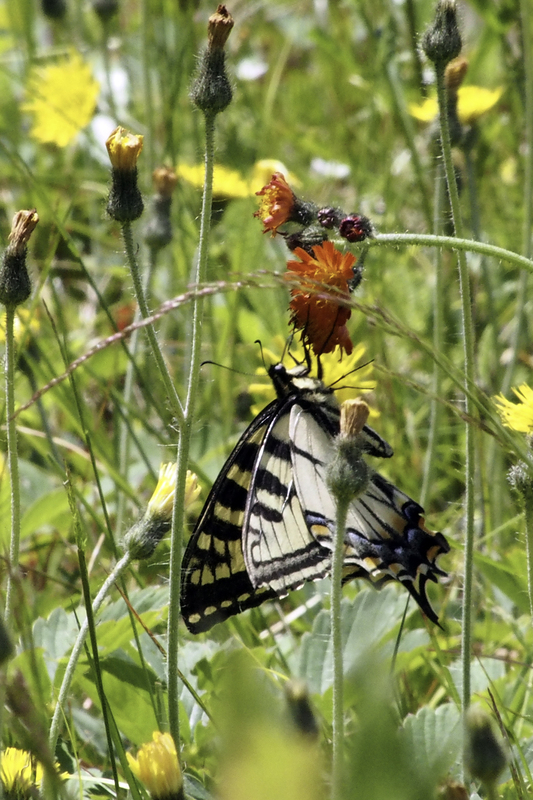 While the Department of Inland Fisheries and Wildlife stocks many local ponds, lakes and rivers with trout and land-locked salmon, they don’t stock Virginia Lake. Yet because of its more remote location, it isn’t over-fished and I often have good luck there (I’ve caught bass, trout, and white perch at Virginia Lake). Two days before, there had been a 24-hour downpour of Biblical proportions. Fortunately I live on the side of a mountain with good drainage, instead of along a river or valley, because there was plenty of flooding. Virginia Lake was so full from the latest rainfall that the shoreline was covered a good 10 or 15 feet with deep water. 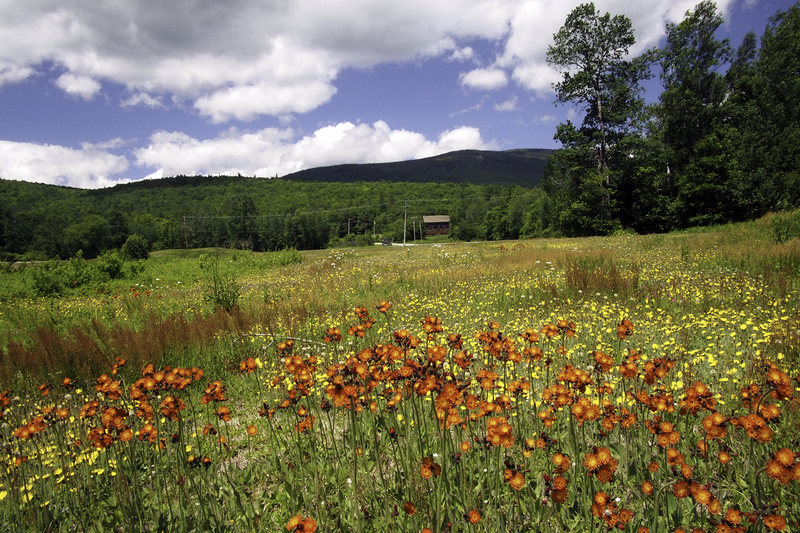 While June is known to be a rainy month in Maine, it has severe implications for the Common Loon population. The loon is an amazing bird. Similar to a duck, it has several unique characteristics that make it a favorite. Its black and white markings and beady red eyes are beautiful; its call is haunting, eerie and magnificent; and its capacity for diving for its food and staying submerged under water for up to 3 minutes is nothing short of remarkable. Also unique are its webbed feet; the loons’ legs are placed way back on its body, which enables loons to dive as much as 200′ under water. That is not a typo: two hundred feet! The downside of their feet being placed so far back on their bodies is that while they are adept at swimming and diving, they are extremely handicapped when it comes to walking. Because of this, they build their nests at shoreline, because they are mostly helpless when they are not on water. The problem is that when heavy June rains flood the shoreline, their nests are often destroyed, and this adversely affects the loon population. Naturalists have tried to encourage nesting loons by building floating platforms or rafts on the water, and while at first wary, loons eventually come to accept the floating “arks,” as is evident on Virginia Lake. The platforms are intentionally placed on parts of the lake that are not easy to spot from the ground, so they will remain undisturbed by humans. Many other lakes and ponds in Maine are experimenting with different types of floating structures to encourage loons to nest and stabilize or increase the loon population. The loons at Kezar, Kewaydin, and Virginia Lakes, while far from tame, don’t seem to mind sharing the water with kayakers such as myself, and they often swim within 15′ of my boat. Last year on Virginia Lake I was able to follow the progress of a mama and papa loon and their one chick over a two-month period. At first the baby would mostly hitchhike on its mother’s back but within a couple of weeks it swam alongside its parents. I was privileged to see the incredible patience of the parents trying to teach their baby to fish! The adult loons would swim directly in front of their baby, and then dip in the water. Then they’d go diving for a fish. When they’d catch the fish, they would lay it in front of the baby on the water. As the dead fish would start to sink, they’d urge the baby to dive to retrieve it. Again and again they placed the fish in front of the baby, trying to teach it to dive. This went on for days until one day, the baby finally got it! On Friday I discovered the location of the floating platform, and sure enough a mama loon was nesting there, resting atop her eggs. It was a good thing the platform was there – – the nest would surely have been wiped out due to the recent storm had it been on the shoreline. 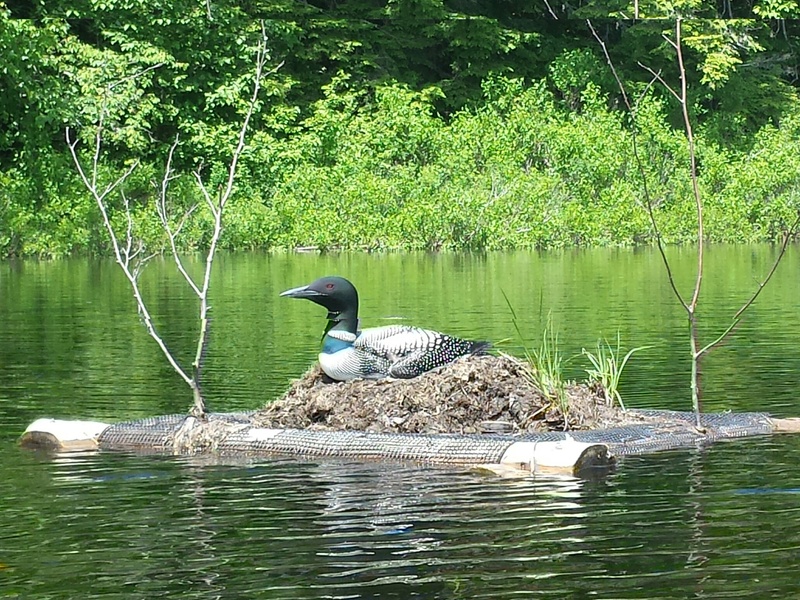 Nesting loon on Virginia Lake. It is on a floating platform built for this purpose. If you want to hear the call of a loon, click here. This was not my lucky day, however, in terms of fish. I caught a white perch but it was too small to keep, so I threw it back into the lake, to live another day. All around me, neon blue and black & white dragonflies and damselflies flew, occasionally landing on my kayak or on my sleeve (they are completely harmless, and in fact help keep the mosquito population at bay). Suddenly near a more isolated, marshy section of the lake I heard a splashing sound. I was very excited – – I knew it had to be a moose (imagine the sound of an adult person walking the length of a swimming pool whose water is 4′ high – – that is the sound of a moose in water). I quietly paddled my kayak closer to the sound. There were a lot of marshy plants separating my boat from the area where the moose was wading, so it was hard to see anything except the top of the cow moose’s head (female, no antlers), who was about 50′ away. What a thrill! Once she heard my paddle in the water, she left the marsh and disappeared into the woods. You may have to use your imagination for this one. 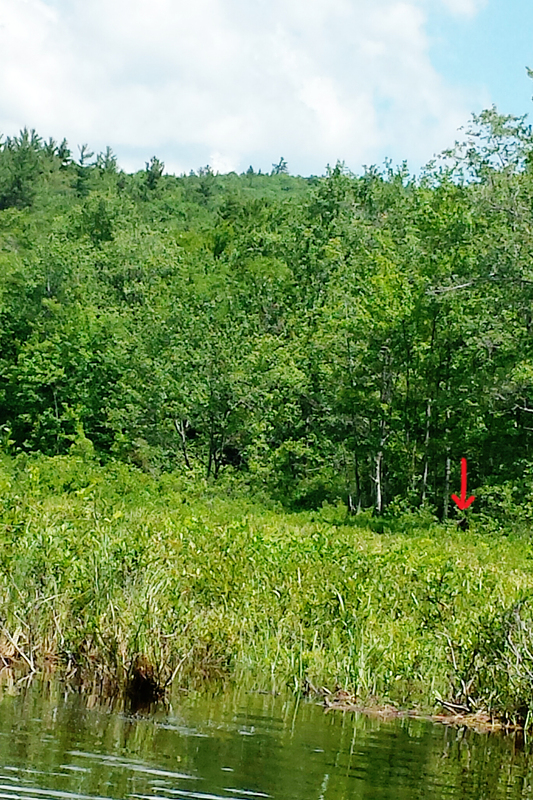 The red arrow points to the head of the moose. There was heavy vegetation separating me from the moose, and since I was sitting in the kayak it was hard to see up over the plants. 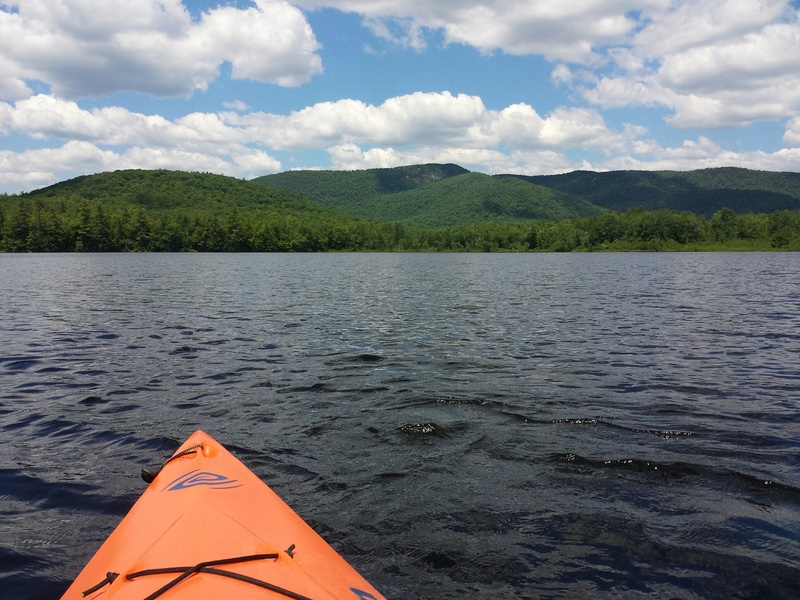 I wasn’t about to stand up in my kayak for a better picture – – I would have capsized! Returning to the shore where my car was located, I stowed my boat and went for a dip in the lake. The water was freezing at first but I soon got used to the chill and relished the clear, clean water. Bass were swimming under me, flitting away as I splashed! As I left the lake, I saw a (non-poisonous) snake crossing the dirt road, and a snapping turtle looking for a place to lay its eggs. A huge grey heron flew in front of me. A porcupine scuttled off into the woods. What a show! It was almost as if the wildlife were welcoming me back to Maine.